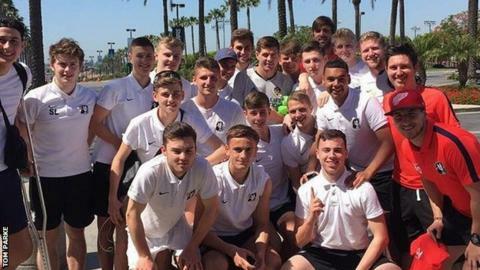 A group of teenagers from Norfolk thought they were going on a stadium tour in Los Angeles - but ended up being coached by Steven Gerrard. It was a case of being in the right place at the right time as the former England and Liverpool captain was left short of players to take part in a practice session for his A licence assessment. And so, 10 youngsters from Dereham Education and Soccer Academy (DESA) were handed LA Galaxy kit and put to work by Gerrard. "Some of the LA Galaxy academy players that were meant to stay behind and help Gerrard went home," academy head coach Tom Parke told BBC Radio Norfolk. "As we were leaving the ground, someone said 'we need your players'. All of our lads were put in full LA Galaxy kit, we [the team's management] watched the session." The session lasted for about 35 minutes with Gerrard's main focus on playing out from the back. After restricting the players to half a pitch, the 35-year-old then coached positional play in an 11 v 11 situation. Following their impromptu outing, the youngsters then went into selfie mode with star players, including Gerrard, Ashley Cole and Giovani dos Santos, collecting the holiday snaps of a lifetime. DESA was founded at the beginning of 2013 and is run in partnership with Dereham Town Football Club with a view to eventually establishing another team in the area. Following a successful tour to the United States in 2015, the academy used contacts to set up a match against LA Galaxy's Under-18 team on their return visit this year, as well as tour of the Major League Soccer club's StubHub Centre ground. Gerrard - who played more than 700 games for Liverpool and earned 114 England caps - even took the time to share some of his thoughts on the game with Parke. "He told me a lot of football is about personalities and characters," Parke added. "He mentioned Didi Hamann at half-time in the (2005) Champions League final, when they were 3-0 down, and having big personalities step up when you're in those positions in matches." So, after unexpectedly spending an afternoon in Gerrard's company, how does Parke think will he fair as a future manager? "I can see him being really successful. The best thing about him is his calm manner, but at the same time he knows exactly what he wants from his players," said Parke, who has a Uefa B coaching licence. "He asked me what I thought of the session and I told him I thought his coaching positions and coaching points were great, which they would be because he knows the game better than most."